Royal Car Wash is a strange little place. not only a restaurant, also a car wash, as the name would suggest. but fortunately the car washing and food cooking activities are quite nicely separated. I’m not sure how that combination ever came about but you have to give it points for originality! Food here will take forever. It’s taken well over an hour both times I’ve been – once with a table of nine people and once just with one person ordering. It wasn’t really that busy either time. But of course if you’ve been living in Kigali for awhile, you’re probably used to the slow service and if you account for it and arrive and order well before you’re super hungry, you should be ok. The food is a nice choice of local fare. The Nyama Choma (roasted meat) gets good reviews and you even get to choose between the goat’s leg, arm or ribs. Chicken and fish are also options. Their pork plate is really tasty too although mine had far fewer bones in it that a friend’s who wasn’t all that impressed. The goat brochettes are also pretty tasty. 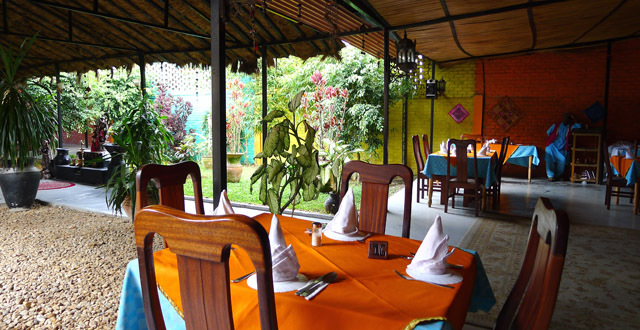 Prices are decent with two goat brochettes, chips and a small salad costing Rwf 3,500 (or Rwf 2,500 on Mondays). They have a special on their burgers on Wednesdays with two burgers bought together costing Rwf 6,000 as opposed to Rwf 3,500 each. There’s also a happy hour between 6pm and 8pm, Monday to Friday where you can get a ‘Bucket of Cheer’ which is five small beers for the price of four. This restaurant is one of the best places to come to watch sports on the big screens. They play most major football games here and the place fills up with rowdy fans, especially when any of the big teams play like Chelsea or Manchester United. Rwandans seem to love those two teams! There are also some food specials during major football matches. I like this place. It’s nothing fancy and the decor and food are simple. It’s not the kind of place that’s going to dole out blankets on a chilly night (and the last time I was there is was just that) but it’s got good prices, the atmosphere is good on game nights, and it makes a good place to hang out with some friends under the stars. Just check the weather first! Ordered for brochette. What was brought was too salty. I rejected it. They took it and “wiped out” the salt. I was told I must eat by Wahome himself as there is no refund. Obviously I didnt eat it.